The Free Ride electric vehicle spotted recently on Pine Avenue in downtown Long Beach. Photo by Stephanie Rivera. 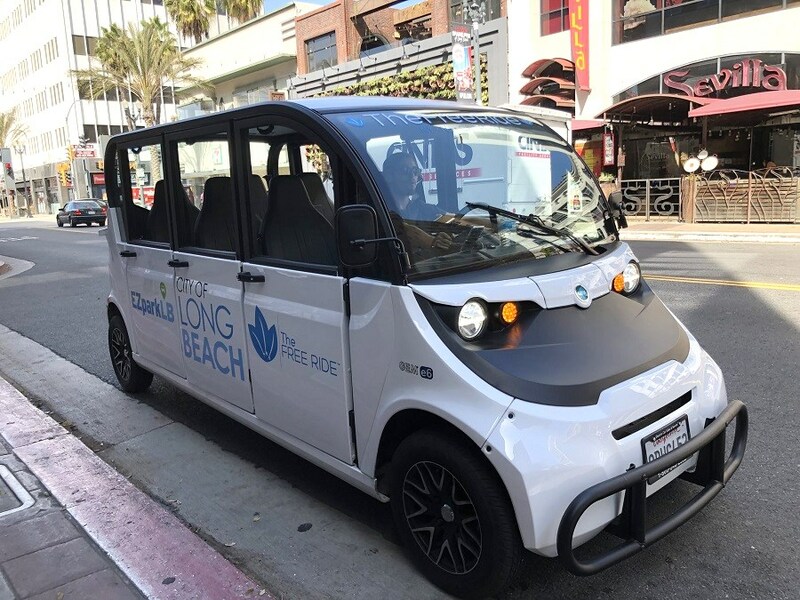 The City of Long Beach has launched a new downtown shuttle service that offers free rides in partnership with The Free Ride app using gas-free electric vehicles. TFR is a new service that launched April 6 and is currently running daily from Sunday to Wednesday 10:00AM to 10:00PM, and Thursday to Saturday 11:00AM to 11:00PM. The app is available on both Apple and Google stores and will allow anyone to request a ride to or from their location for free from the app’s designated travel zone. TFR offers free transportations from designated travel zones: 5th Street to the north, Alamitos Avenue to the east, Shoreline Drive to the south, and I-710 to the west. Founded by James Mirras and Alex Esposito in 2011, TFR has given over 2 million rides and expanded to 14 cities across California, New York, Florida, New Jersey and Texas. According to officials, the free shuttle service is part of a two-month pilot program managed by the Department of Public Works, and is made possible through $100,000 from Prop A funding. At the end of the two-month pilot, the program will be evaluated and a decision will be made on whether to make it a permanent program in Long Beach. The pilot program is scheduled to finish around the end of May though no exact date was given. For more information, visit longbeach.gov or The Free Ride.